A favorite community gathering place will soon be renovated. Peavey Plaza was an instant hit. Downtown workers on lunch break and children of all ages enjoyed its water works and multiple subterranean levels. Its next-door neighbor, the Minnesota Orchestra, used the plaza for special events. 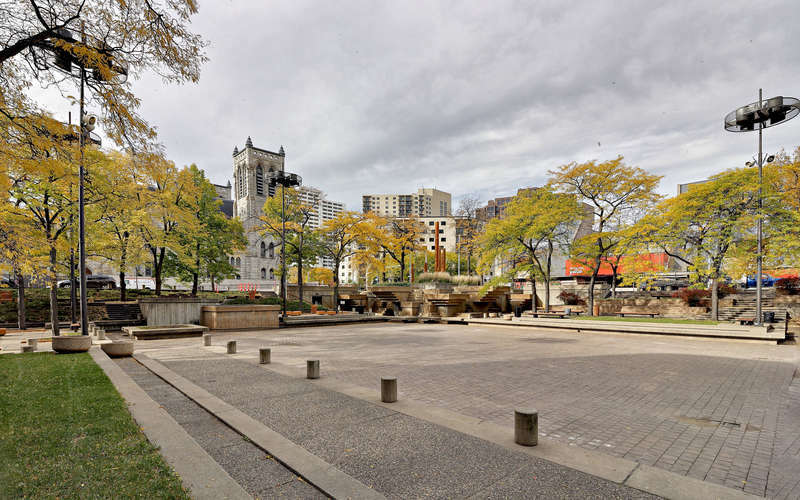 In 2008, the nonprofit Cultural Landscape Foundation declared the plaza a “marvel of modernism,” and in 2012 the plaza was added to the National Register of Historic Places. But by the 21st century, the plaza was showing its age, and the city could not afford much-needed maintenance. Due to mechanical problems, the fountain was turned off and the 28,000-square-foot pool was drained. The plaza’s many concrete steps and islands were cracking, and some of its trees had died. Then, in 2013, the renovation of Orchestra Hall pushed out into the plaza’s east side. Charting a course for Peavey Plaza has been difficult. 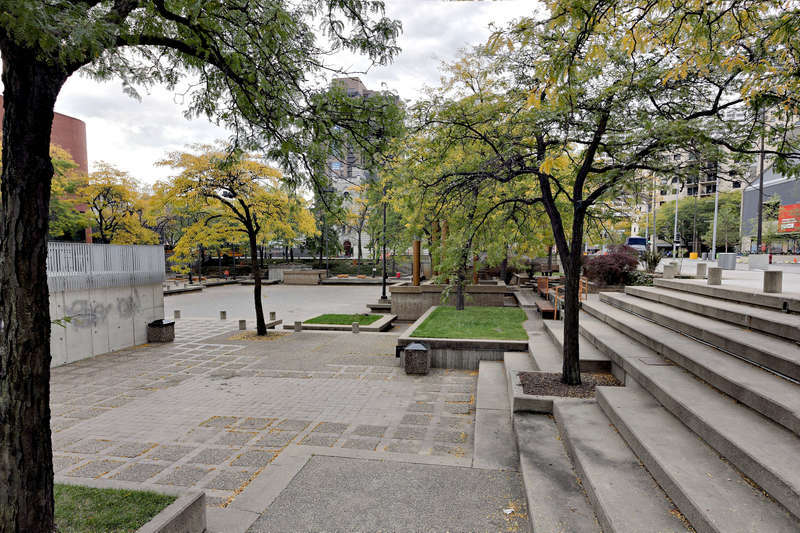 A 2011 plan addressed a variety of maintenance, water and accessibility concerns, but only by making dramatic alterations to the space, including filling in the plaza’s steps and levels. But in 2013, the Minnesota Preservation Alliance and the Cultural Landscape Foundation won a lawsuit that challenged implementation of that plan, sending the city back to the drawing board. Since then, there has been much study and debate. Working with all stakeholders, a new team of Preservation Design Works and landscape architects Coen + Partners, has developed plans that balance the various interests. Much of the original water works will be repaired, and a new pool will have less than an inch of water over a dark granite base, offering the appearance of a pool but without the wasted water. New ramps will enable persons with mobility challenges to access the multiple levels. Ash and linden trees that are vulnerable to disease will be replaced by more robust varieties. Areas covered with both turf and paving materials will be permeable, and water for plants will be collected underground and recycled through the fountains. 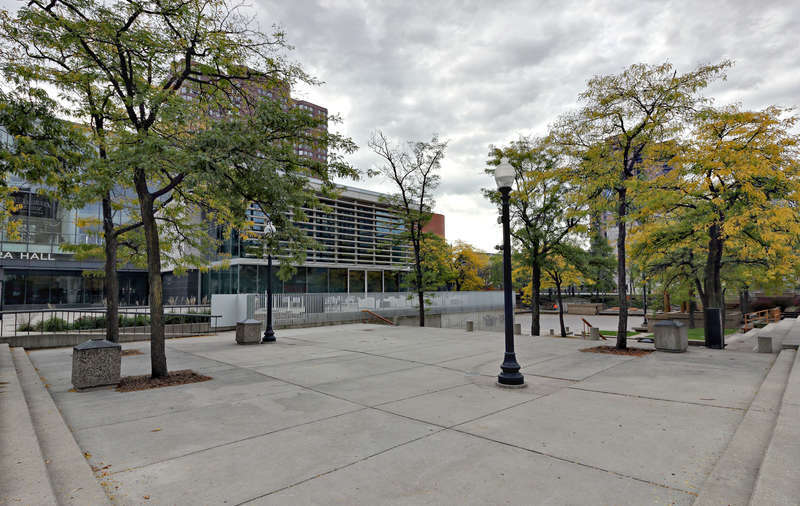 Peavey Plaza’s next incarnation will be an improved and more sustainable version of its old self. Peavey Plaza is a public park. 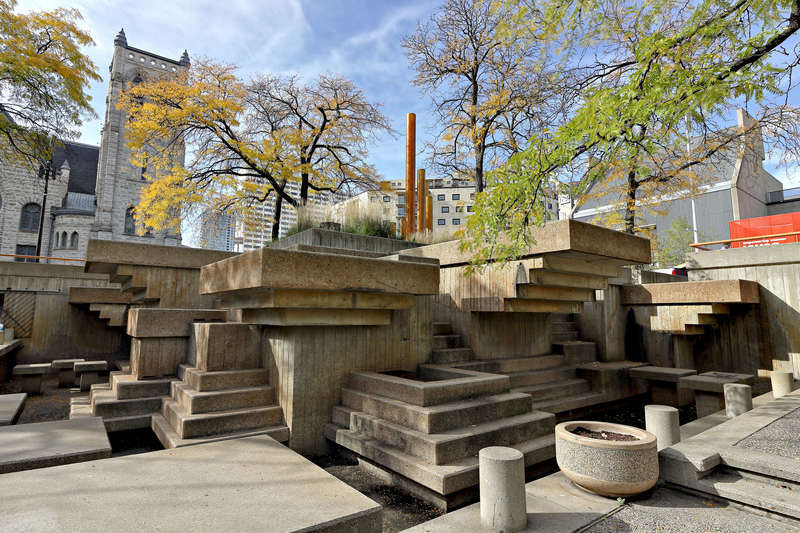 Richard L. Kronick & Lisa Middag, “Peavey Plaza,” Minneapolis Historical, accessed April 18, 2019, http://minneapolishistorical.org/items/show/160.